Does setting the film on a familiar human dominated Earth create a more individual film for the franchise? Two talking chimpanzees crash land on Planet Earth and are welcomed into society, but they soon outstay their welcome when they’re deemed to be a danger to the future of humanity. After the previous film’s story and characters reached a point of stagnation, it was essential for this installation to take a new direction, and it absolutely does. With two chimpanzees arriving on earth in present day the role reversal is returned to the norm. This is brilliant to watch right from the beginning, especially in contrast to the hostility displayed previously (let’s just say that humans are kinder to apes than apes are to humans). The film even offers a brilliantly executed insight into how apes become the dominant species in the future, which proves a fascinating addition. The two apes, Zira and Cornelius, both played fairly prominent roles previously, and carry the lead roles with great effect here; Zira becomes particularly endearing after already being displayed as kind and merciful in the future. Bringing these two back for the third film was a stroke of genius, building on a pair of characters that were already well established and liked. However, it’s not all-good news. The film annoyingly tip-toes around a few plot holes; as soon as the visitors arrive on earth to a handful of military personnel, they’re taken to Los Angeles Zoo, where they change into new clothes and eat with cutlery. Surely there would be more of an investigation before two random scientists/zoologists and a caretaker get to start their tests. It all just feels a little small scale for such a big event, a problem that two previous films managed to avoid. As well as this, we see a twenty-minute period of the apes settling into normal human life, with them hosting women’s rights seminars and shopping for a suit. It all gets a bit bizarre, comical, and grinds the story to a halt. 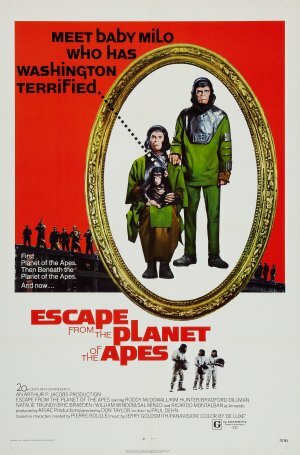 Despite this, Escape from the Planet of the Apes provides a fantastic new direction for the franchise and is an especially enjoyable continuation. Some moments are a little odd and may have you scratching your head, but the film is thoroughly enjoyable for the large part.